Not all great manuals had to come from the dawn of time. 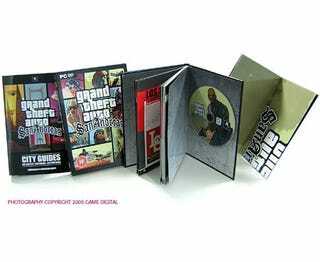 Rockstar put a surprising amount of work into San Andreas' PC edition, with the game box remodelled into a tourist guide to Grand Theft Auto's fictional state. Where the guide began and the manual ended was often a blur, and for this reason it remains one of the few boxed PC titles still in my collection. Not technically a manual, I know, but I couldn't let a discussion about them pass by without pointing out one of their siblings, the copy-protection device. While some older manuals were themselves a form of copy protection (games prompting you to enter words found on a certain page), Monkey Island went one better and included this code wheel, which was so great it was used again for the game's sequel. The game's manual wasn't the greatest, but the junk that came with it was. Included with Wing Commander 3 was a range of fictional reference material, like technical specifications for the game's starfighters and even an armed forces newsletter, complete with email addresses for those involved. For a game released in 1993, email addressed was a nice touch. The manual. You cannot speak of instruction manuals for a video game without mentioning Falcon 4.0's, the colossus of the field. I mean, look at it. It's not a book, it's a tome, a collection of individual booklets giving you everything from detailed instructions on how to fly an F-16 down to the conditions you could expect to face in the game. When I first saw this, my mind could not grasp how heavy the game's box was with this inside it. Then, when I got home and after ten minutes couldn't even get my fighter off the ground, I realised it wasn't just big, it was necessary.